This is just about the easiest little salad ever. I told you earlier in the week how infatuated I was last summer with rice salads, and now that the weather has warmed up, I can’t get them out of my head. I’ve been dreaming about all type of ways to reinvent a rice salad. This was my latest creation I made for Cinco de Mayo. It’s loaded with spinach and cilantro for a brilliant color and unique taste. I’m a firm believer that spinach can make you as strong as Popeye, so I love to incorporate it in as many meals as possible. processor. I added a jalapeno for a spicy kick as an optional ingredient. We added it our salad, but I omitted it from my son’s rice salad. Happy Mother’s Day Ladies! I’m off in a few minutes with my family for a relaxing afternoon. I’m not sure what’s on the agenda, it’s a surprise! Get Grillin’ with Family Fresh Cooking and Cookin’ Canuck, sponsored by Ile de France Cheese, Rösle, Emile Henry, Rouxbe and ManPans. 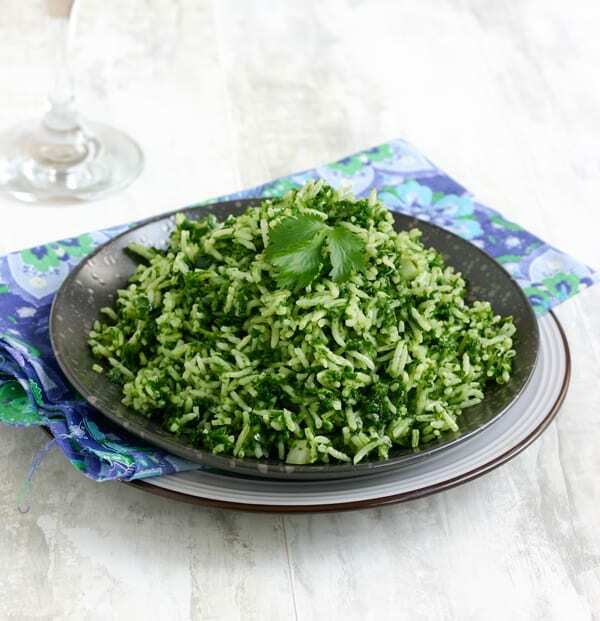 Take fresh spinach, in batches, and pulse in food processor until finely chopped. Add cilantro to food processor and pulse until finely chopped also. Add cooked riced, chopped spinach and cilantro, lime juice, olive oil and diced onion to a large bowl. Add jalapeno if using. Toss to combine. Serve room temperature or chilled. This is so darn pretty. What a wonderful salad! I hope you had a relaxing Mother’s Day. Looks so fresh and flavorful, love this! Beautiful, healthy and delicious! Love this!! I love this recipe! So fresh and full of flavours! lovely photo. The recipe looks good too. Will give it a try.